A school in Scotland that supports and accommodates 190 pupils with additional needs has been built to deliver an education environment worthy of its staff and students. ‘Carrongrange’ which is an Additional Support Needs (ASN) school in Grangemouth is now open, providing a raft of support to further enhance the learning and future of its pupils. When Falkirk Council required flooring for this education project they would turn to international flooring specialist Gerflor to supply 4000m2 of flooring products that could deliver stunning looks, durability and performance. Jack Aitken, Education Design Co-ordinator, Falkirk Council commented, “A need was identified for a replacement of our existing Additional Support Needs secondary school. The new facility in Grangemouth has been designed to meet the current range of very specific pupil needs”. On specification Jack Aitken added, “Falkirk Council have used Gerflor on a number of school projects in the past and the products have been very well received on each occasion”. You would be hard pushed to find a head teacher who is prouder of her school than Gillian Robertson. The head of Carrongrange High School loves every aspect of the new additional support needs learning facility located in Grangemouth. It was built over the course of 18 months to replace Larbert’s Carrongrange School. “The total floor area is actually the same as the Larbert school, but the layout and colours of the flooring here makes you feel it’s so much bigger” she said. The pupils themselves also had a hand in designing the badge for the new school, and by using Gerflor’s water jet cutting system could have their new logo incorporated into Gerflor’s Mipolam Elegance flooring. Jack Aitken went on to further say, “The new school only opened in August this year, and the flooring is performing really well. The staff and pupils are very happy with the Gerflor products, particularly the cushioned flooring in the gym”. The flooring area to be covered at Carrongrange High School was a huge challenge and easily met by Gerflor who provided a range of fantastic products from their vast arsenal of wide-ranging flooring solutions. The flooring specification would need to include; wet rooms, changing rooms, corridors, classrooms and offices. The vast cornucopia of products supplied would consist of Gerflor’s award-winning Taralay Impression Control safety flooring, together with their Tarasafe Ultra and Tarasafe Ultra H2O. With over-70 years’ experience Gerflor has honed their expertise in safety flooring to produce the highest standards possible. Gerflor won the 2016 CFJ/CFA Product of the Year category with their Taralay Impression Control safety flooring range. The Taralay Impression Control flooring collection is the perfect option where high volumes of footfall are expected. A multi-purpose floorcovering available in 2m sheet format with a Group T wear rating, it’s ideal for a host of environments where slip resistance is a must. Available as a dual collection: – ‘Safety in Wood’ and ‘Safety in Design’, the range includes realistic woods in contemporary colours and modern all over designs. Taralay Impression Control also has a Pendulum Test value +36, meets HSE guidelines (BS 7976-2), a surface roughness of >20 RTM-RZ and R11 ramp test value (DIN 51130), together with providing 24 design-led colourways. Taralay Impression Control also offers a hygienic solution thanks to a revolutionary UV cured PUR surface treatment for easy cleaning and maintenance. With the Protecsol® Control surface treatment it’s easy to clean and is 100% recyclable. Changing rooms and showering areas in many educational locations can often be wet and slippery environments and that’s where Tarasafe Ultra H2O from Gerflor is the ideal solution. Intended for traditional barefoot spaces where there are continuous wet areas, Tarasafe Ultra H2O also offers a shod solution, providing a perfect blend of flooring applications for those areas where wet flooring conditions can be an issue. Within Gerflor’s other top performing Tarasafe vinyl safety flooring range there are over 80 finishes available to choose from. They are reinforced with a glass ﬁbre grid and are suitable for use in all areas of heavy trafﬁc where slip-resistance, durability and hygienic conditions are required. Using mineral crystal particles, rather than the industry standard carborundum, Tarasafe, with its improved performance, is easier to install, lighter and more flexible to handle. The range has a maximum hygiene rating meeting the EN Standard 22196 for anti- bacterial activity (E. coli – S. aureus – MRSA) (3) returning >99% levels of growth inhibition and comes with a 12-year warranty and is also 100% recyclable. The Tarasafe Standard range comes with the unique UV cured PUR surface treatment and their Tarasafe Ultra range (excluding their Tarasafe Ultra H2O offer) also sees a benefit from the SparClean® surface treatment, therefore no polish for life. This massive flooring project would also highlight that Gerflor are easily able to supply differing products for a wide range of applications. The Carrongrange development would also specify Gerflor’s GTI MAX and Mipolam SD products to further complete the huge overall flooring requirement. 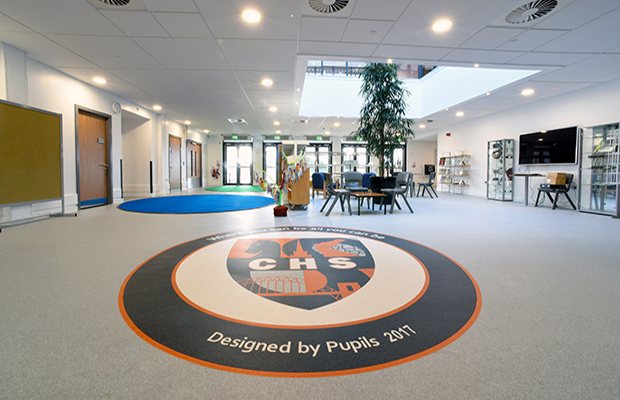 Jack Aitken concluded by saying, “We would be very happy to use Gerflor products on future school projects”.